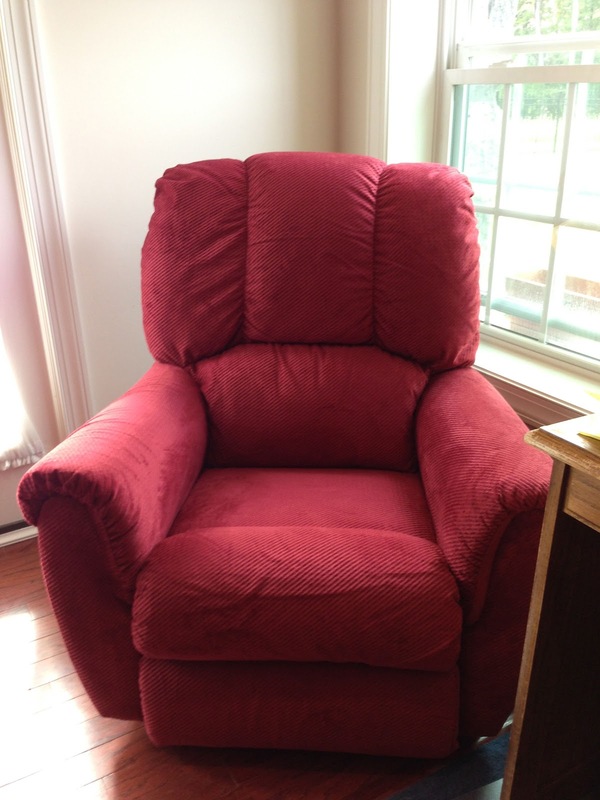 My birthday came almost a month early this year with the arrival of this... my own recliner. I love our sofas but when I sit on them the girls, well, clobber me, and this way I have a place that is just mine. 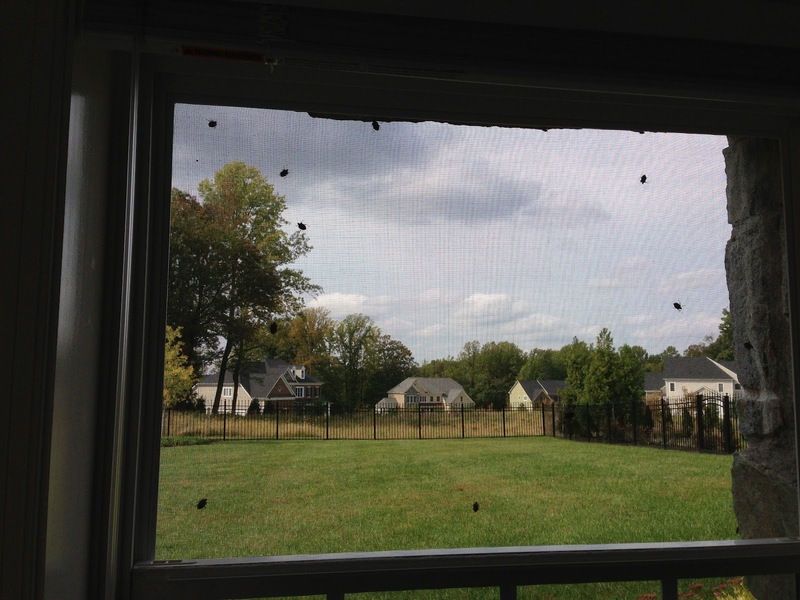 We've had a few days this year where the stink bugs are just horrible. They are such a nuisance. 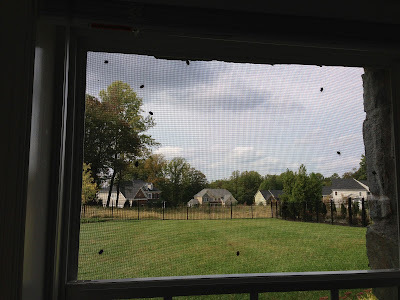 I mean, they don't bite or anything, but, unlike flies, which are just stupid, stink bugs actively try to get in the house and when they succeed, they don't find a window and try to get out, they try to hide. While swatting them with the broom, I've had two fly and land on my neck and I panicked James in the car when I turned my head to find one crawling on my shoulder. They try to get into the car too. BUT! Our back door has a sliding screen door. By keeping it not in front of the door but rather in front of the window beside it, it has become an unintentional impromptu stink bug trap. The dolts crawl behind it when they surround our door and struggle to get out from behind it. Then, at night, when the temperature drops, so do they. (Insert wicked laugh here). They will perish! Well, I officially began the 3rd trimester. But it began feeling like it two weeks ago. (Is it any wonder I never make it to a due date and always give birth in the last two weeks?) Indeed, I am more scatter-brained. I discovered yesterday after the queso had been cooking for an hour that it was cooking on high instead of low. The odor of burnt cheese alerted me. I end up apologizing at the end of every email for how babbling I get, how my sentences don't quite follow logic and how it would be too difficult to correct it. I'm slower and more tired, despite 8 straight hours of sleep. And my "what can I get done today" mentality has been partially replaced by a "go away, I don't want to do anything" approach. Cecilia has been learning about the planets and is absolutely fascinated by space. 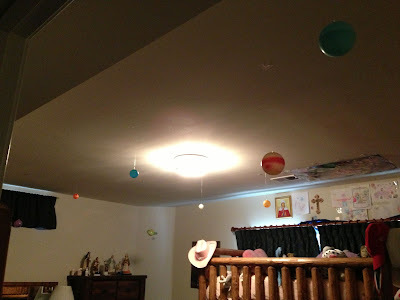 I'm stalling a bit until it is darker earlier to borrow Grandpa's telescope but I bought glow-in-the-dark plastic models of the planets and, using the ceiling light in the center of the room as the sun, hung them in order moving away from the light. Not surprisingly, Mercury glows the brightest. :) The girls love them. Now if I could just get Neptune and Jupiter to stay up, it'd be perfect but going up and down on the chair, while pregnant, makes me dizzy, so that is still on my to do list. James and I Netflixed the recent film of The Lorax. Take my advice. Don't do it! It is awful. From the out of place musical numbers to the one dimensional characters to the ridiculous exaggerations of circumstances to the disregard for the poetry of the book, it was sheer agony to watch it. The only aspect noteworthy is the animation. 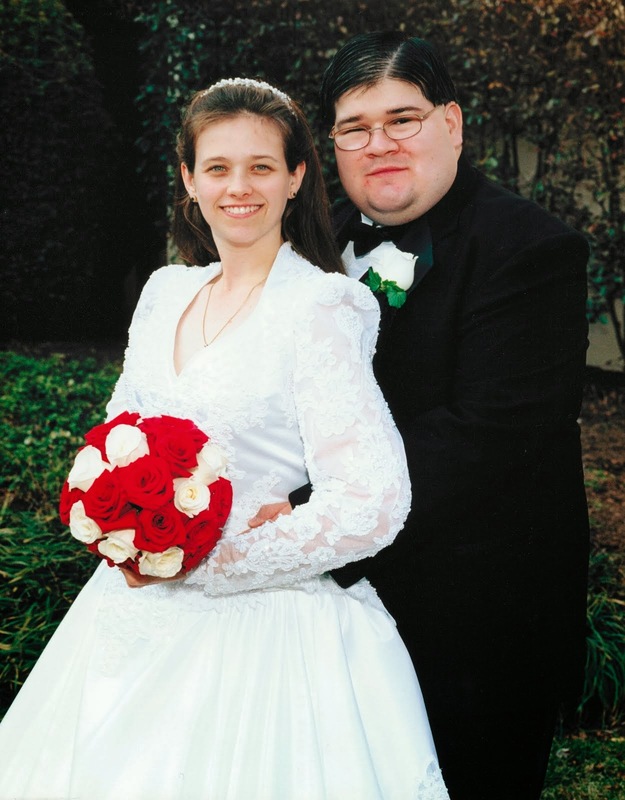 James rented it in the hopes that it would have some redeeming aspect. It didn't. It never should have been made. Dr. Seuss would be appalled. I'm appalled on his behalf. 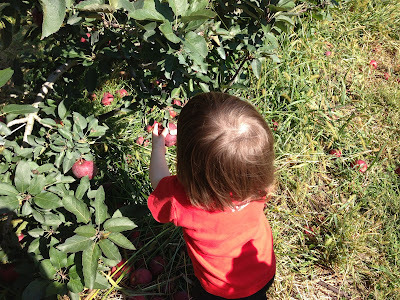 We made a trip to a local farm for some fun in the hay bale maze, pumpkin picking, and apple picking. Teresa picked her first apple. She was so excited. She loves apples. We just had to be super vigilant she didn't just start eating one or grabbing them from the ground. 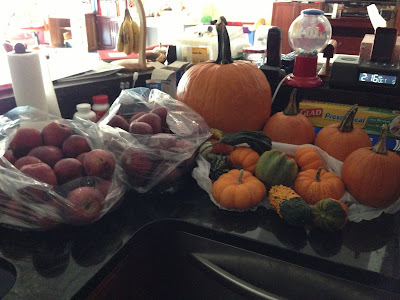 Cecilia was ecstatic they had Red Delicious apples to pick... her favorite! Definitely a bountiful harvest. And it was really reasonably priced to boot! Blessed Feast of St. Faustina!!! 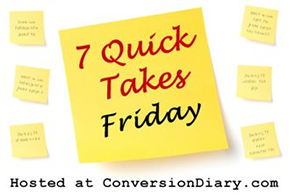 More Quick Takes at Conversion Diary! The Lorax previews looked pretty awful - as if they tried to take what is legitimately a vaguely-depressing (in a good way! )moral tale and make it a fun, happy musical. Well, I'll definitely not waste my time seeing it now.